Nusense came again to Santander just for one night and we went to Liérganes to walk up to a hill. It was probably kind of the worst day she has ever had!! hahaha!! When we got there the wind was so strong that we could hardly walk. Anyway we decided to go on and walk the route to the Pozos de Noja, already mentioned in previous posts. Only a londoner could be wearing those clothes at the same time she is climbing a mountain! !I lend her my scarf and she looked like a gangster!! haha! When it comes to cigarettes (specially Fortuna) sometimes she gets a bit greedy!! haha, anyway it's a funny picture. I took my mum's umbrella with me. She first used it as a ninja sword and then when it started raining she let the wind break it to use it as a flag!! Those pictures are evidences! When we were arriving to the top we decided to go back because it was raining very heavy and the ground was too moody for Nusense's crap shoes. 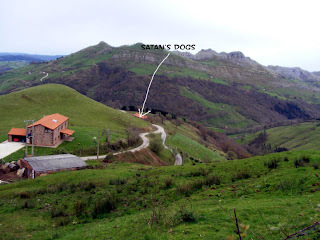 But on the way down we meet 3 HUGE SATAN's DOGS that almost ate us!! (in the picture above you can see the house they belong too). I think they were spanish mastiff. The first time we saw them i had to go backwards because they were huge and scaring. But there was no other way to go and Nusense had to take a plane so i managed to get a stick and we faced them. We were almost passing by the house when the 3 dogs suddenly showed up on our back!! they were barking with a low spitch and we could even feel their breath on the back of our legs and ankles!! We were brave enough not to run and kept walking normally, although we were shitting on our pants!! haha! For the next time, i have to take an ultrasound device to scare them, i think they were really dangerous. I don't know what the owner is thinking about.. grrr!! By the time we arrived at the train station we were completely soacked and wet. An these are the last pictures at the airport before she went back home to London. If you take a close look at my face you may notice a blue spot on my face!! She did it when we were playing pool at Valle Real and made fun of me by taking pictures without me knowing haha! Cool pictures! Remember when you got scared of those three dogs on the mountain? I had to hold you to reassure you everything will be ok! Are you sleeping ok after that?